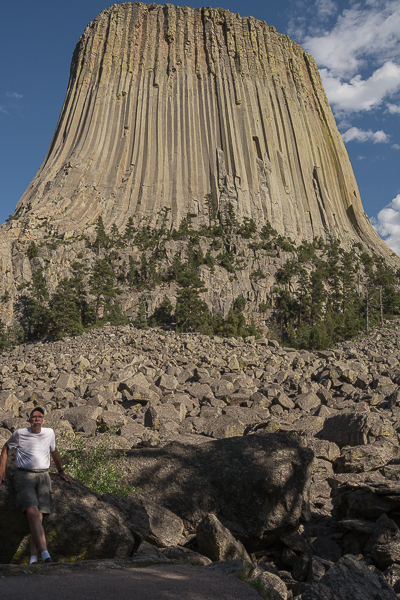 Today we have not planned an all day trip to Devil’s Tower (no preparation, just drive, get home when we get home). We stop first at the Pactola Lake Visitor Center a US Forest Service facility located just before the first curvy spillway Storm and I had ever seen. Next stop is the town of Deadwood for the obligatory drive through this old west town. Unless you like to gamble (something I am not very good at), there is not too much to visit here except some touristy shops and attractions. Parking in town is tricky and expensive. If you can find a spot at the visitor center, they seem to cost the least. 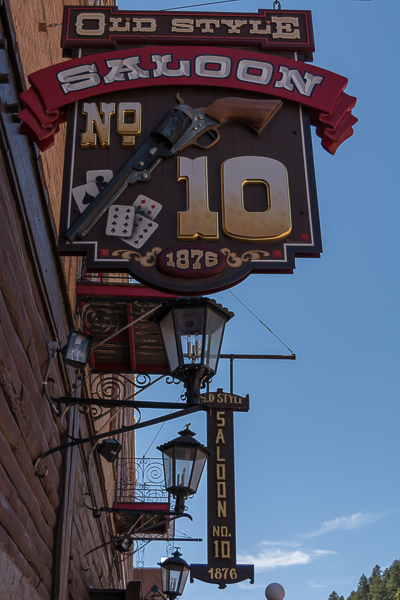 If you are there in the afternoon you can witness a shoot-out on main street. With no time for gun-toting desperadoes and after some people watching on main street we load up and head out. Now this is the way to have lunch! Leaving Deadwood, I accidentally tell Storm to follow 85-S rather than heading North to the interstate and as a result of this wrong turn we ended up on the Spearfish Canyon Scenic Highway. Along the way we find an amazing picnic spot at Roughlock Falls where we can both dine and soak our feet in a cool, clear babbling brook. If you are wondering what to do with your Twin Bonanza when you get tired of flying it, click here for a unique story about a plane on a pole that we passed on I-90. I did not get a picture (you can see one if you follow the link) because I was too surprised at what looked like a plane in good shape blowing in the wind atop a pole beside the interstate. In the past I have ridden by Devils Tower National Park on my motorcycle and seen it from a distance, but had never been up close. We arrive at the park at the exact time as an extremely windy thunderstorm. Undeterred, our group joins the trail around the base for the 1.3 mile hike narrowly avoiding being blown into the valley below. I am thrilled to discover this loop that takes us all the way around the base so that I can get lots of photo ops. Before learning of this trail, I thought I could only get near the Tower by climbing it or by being deposited there by aliens. After our hike we decide to take the Wyoming roads (585 and US 85 to US 16) back to Custer. As we approach Newcastle we are treated to a view that seems to extend to the curvature of the earth. A long day for us but one filled with amazing and unusual vistas.